I have, of course, persistently refused to go out of my way to learn any of the lore behind the various superheroes who dominate our pop culture and the international economy today, which is just as well because with all the reboots and so forth the characters’ pasts are ever-changing anyway, but my understanding is that Peter Parker got into the stringer newspaper photography game not because of any burning desire to be a journalist but because he knew the Bugle’s management was obsessed with running pictures of Spider-Man and he was uniquely positioned to sell them said pictures and so it was a way for him to make money without doing too much extra work. The desire to not do too much extra work is of course one of Newspaper Spider-Man’s defining characteristics, so it really fits in well in this iteration of the Spidey multiverse; being a stringer photographer for a daily paper also pays very, very little, which fits in nicely with Newspaper Spider-Man’s overall stupidity as well. What I’m trying to say is that I’m not really buying Peter’s moral dilemma here! The idea that Peter has gotten a taste of journalistic fame and now he wants more is only marginally more believable than the idea that he cares about the Iron Fist’s privacy or whatever! 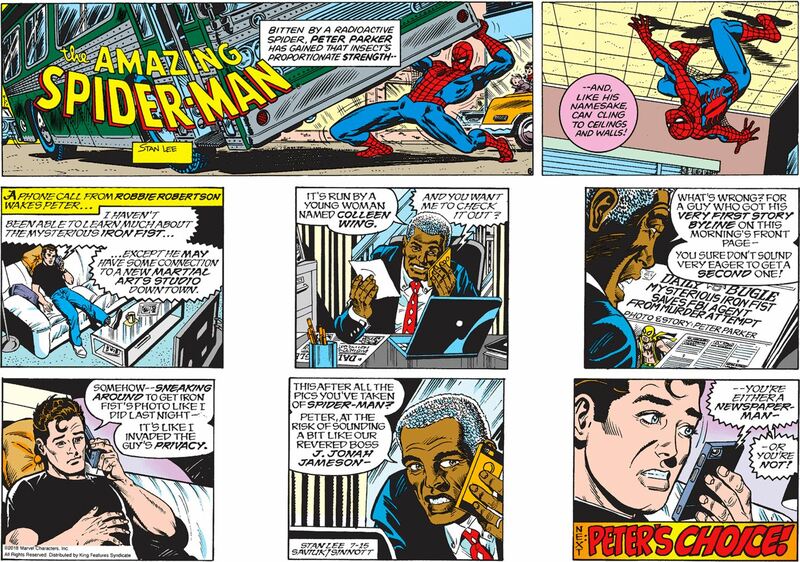 I reiterate an idea I put forth over a decade ago: Peter should just use his spider-powers to take pictures of celebrities and sell them to TMZ or the like. The moral stakes are lower all around, and presumably the gig will be so lucrative that he’ll eventually stop fighting crime altogether. I don’t know that I would start my Sunday comic with a warning to the reader that, though they may think they’re safe from baffling and enraging faux-rustic wordplay, the next few panels are about to prove them very, very very wrong. But I’m not the guy currently in charge of the century-old Gasoline Alley intellectual property, I guess!